and a shawl which I just started last night. My requested Christmas gift was a set of interchangeable circular knitting needles and the cords. This shawl is the first project I’m doing with them. 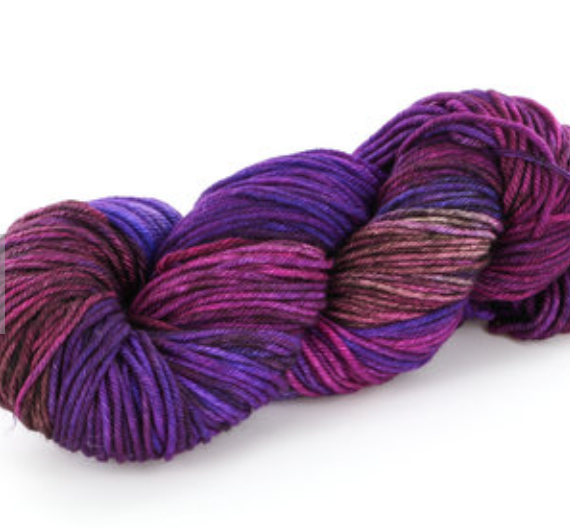 I also treated myself to an order of new yarn which has yet to arrive. Three different sock weight yarns and some worsted weight yarn for a new sweater. All were on sale for really good prices. For the sweater it’s Malabrigo Rios which is a yarn I’ve used a few times before and really like. It’s this colour here - A really pretty combination of purples and pinks. I’m looking forward to it arriving. 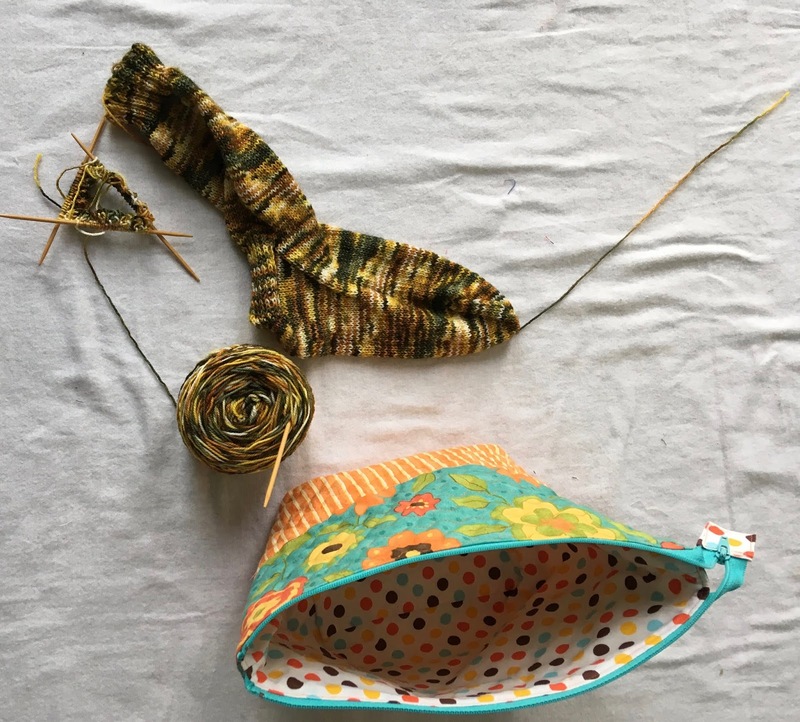 I noticed in the last couple of months working so intensely on hand stitching projects that I was missing knitting. So I’m fitting time for that into my days now. I’m linking up to Kathy’s Slow Sunday Stitching and then it’s back to the knitting needles. 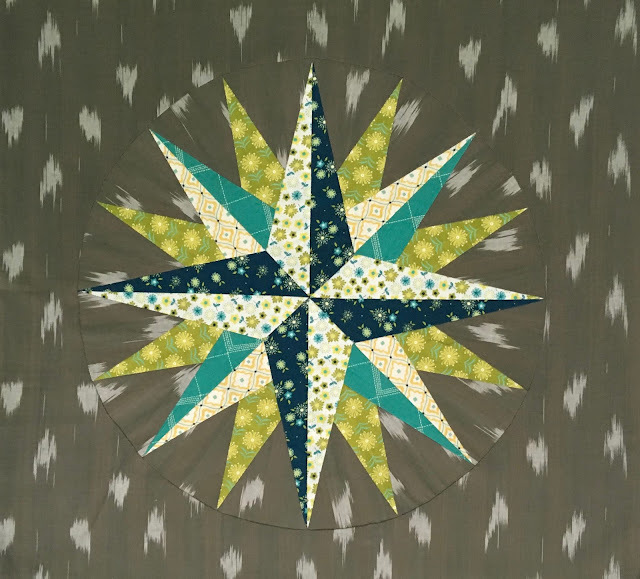 I’m still working on the compasses quilt and making good progress. The decision about the outer curved geese that I thought I could leave till the end wound up being made much sooner than I thought it would. 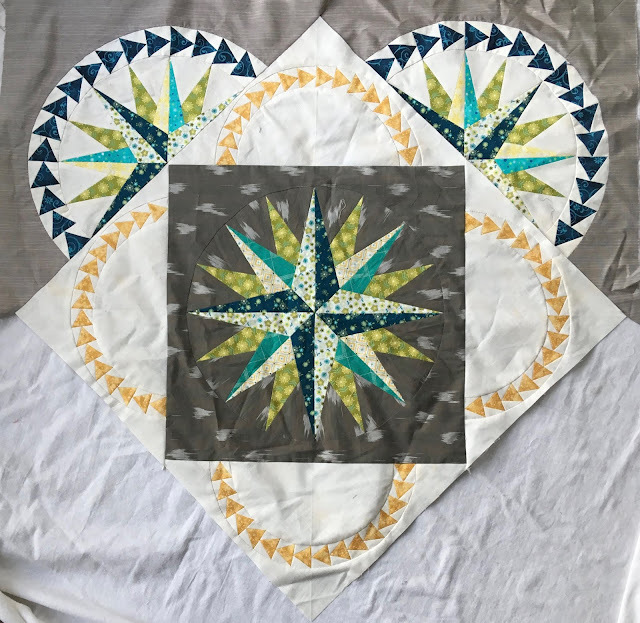 It started out sooner because of trying to fit making the curved geese and sewing them on a couple at a time when doing up that first half compass. It turned out not to work very well doing it that way because they didn’t line up around the curve as nicely as I wanted. But trying it that way meant that I had to decide on fabric and colour sooner than I thought. I ended up going much darker than I thought I would in the fabric choice and it’s a good thing too. The yellow/gold of the earlier round of curved geese would have gotten lost near the grey of the outer background triangle. So now all the half compasses are finished and I’m working on the navy curved geese. It’s a fiddly process, but enjoyable none the less. 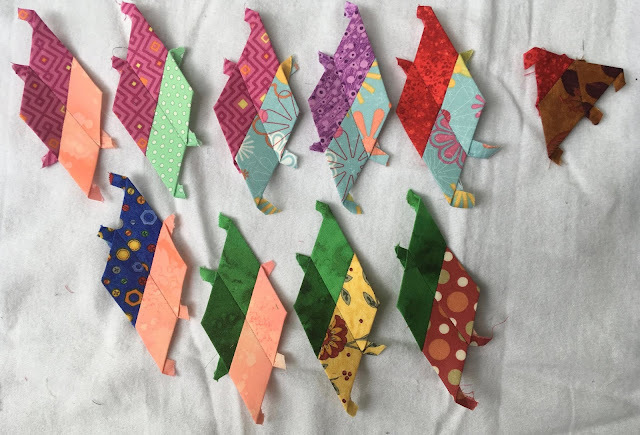 Once the 16 curved geese are pieced together I will turn under the inner edge of the geese and appliqué them down to the half compass. 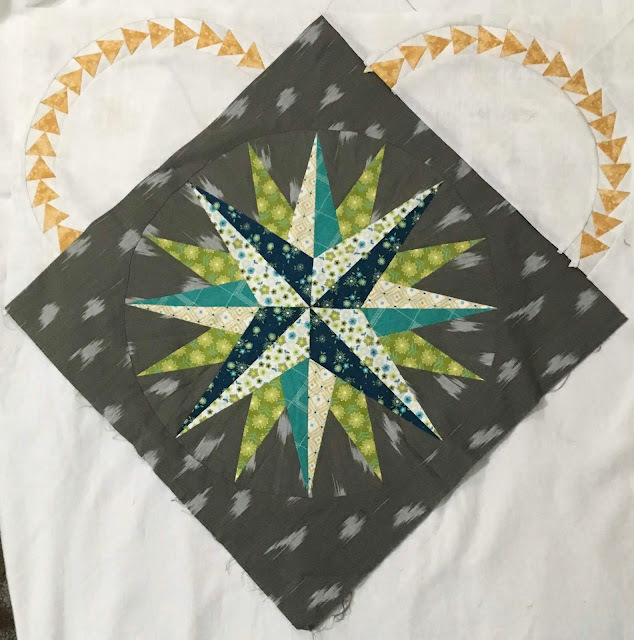 Then I reverse appliqué the finished half compass unit to the grey triangle. All of this amounts to a lot of very slow stitching by hand. 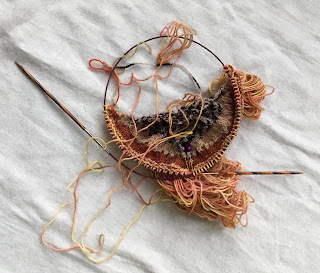 I’m linking to Kathy’s Slow Sunday Stitching. And since it’s unlikely that I will be posting anything before Christmas day arrives, I want to wish all who read hear a very merry Christmas! I’ve finished Friendship Chain, the top that is. It’s not quilted yet. I still have customer quilts to get done on the long arm before Christmas before I can load one of my own. In the meantime, I’m working on another hand piecing project. Last August I sewed up this Mariner’s Compass. I wanted to do more with this, as the finished compass here is only 16 inches. Not really big enough to do anything with it, besides a pillow, and I don’t need any more of those. So I played around in Electric Quilt 7 and come up with a design that I like. I’ve shared it before. The colours aren’t the same as what I’m using, and the background fabrics are a bit out of scale, but the layout idea is there. 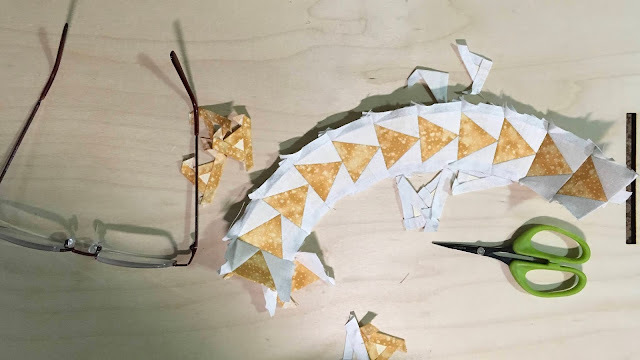 I’ve gotten one of the curved geese arcs almost finished. 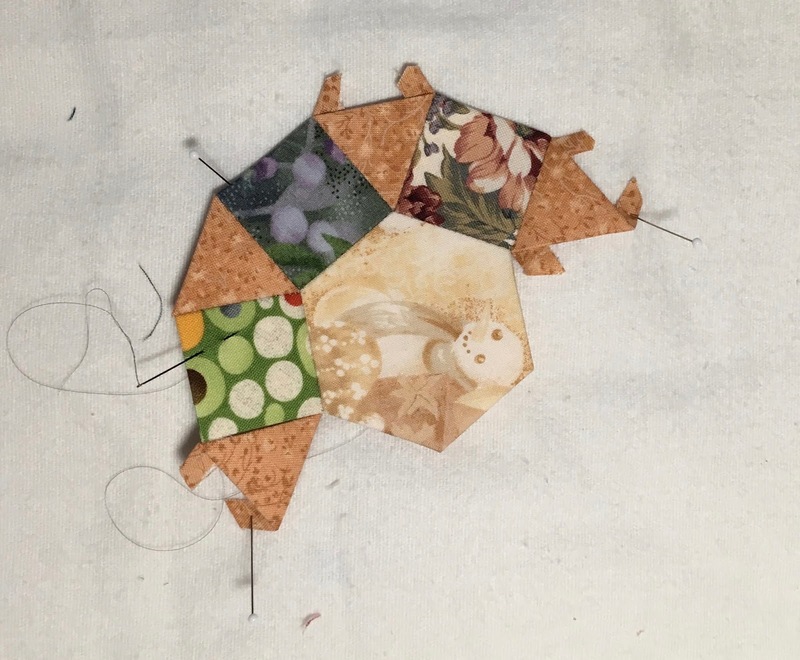 The pieces are quite small, so they stitch together very quickly. 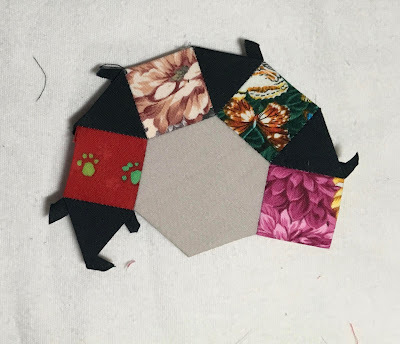 I’m using English Paper Piecing to do these. 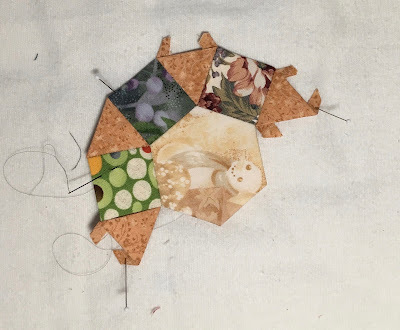 The arcs will be reverse appliquéd into background triangles. 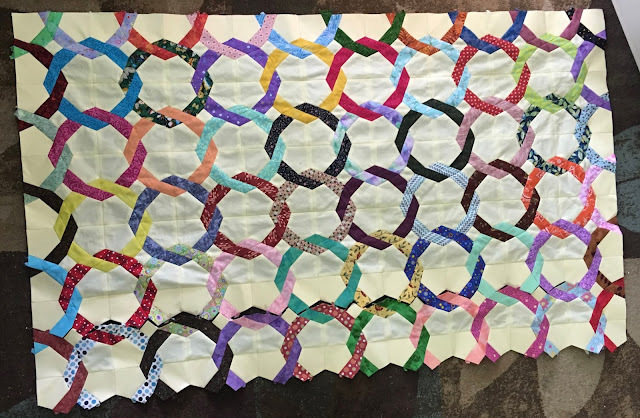 I’ll be linking up to Kathy’s Slow Sunday Stitching. It’s a wet and gloomy day out there today which makes it a prefect day for being indoors and slowly stitching. I was hoping for sunny though, or at least cloudy and dry because I wanted to do my photos outside where the light is good. But I had to make do with the living room area where there was enough room to spread out after re-arranging a couple of things. I’m making good progress on Friendship’s Chain. Only 2 1/2 chains left to finish. After that I just need to sew this last row in place and it is done. 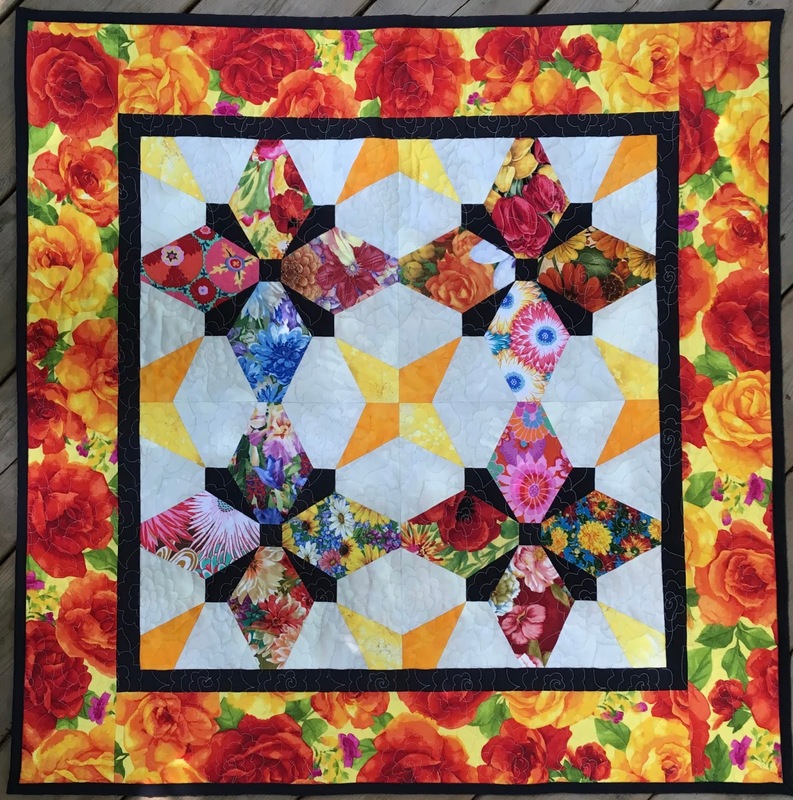 It is so exciting and so much fun to get a quilt from design concept to actually finished. It is all English Paper Pieced. The pattern is almost finished as well and is being edited by a good friend of mine. The finish of this quilt and the finish of the pattern might just happen close to the same time. And of course, like most quilters. 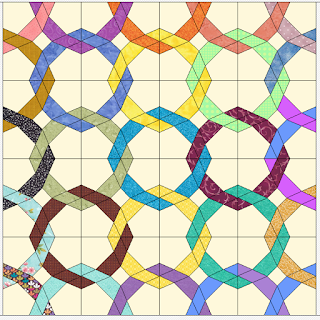 I have my next project already in my head and into a drawing in Electric Quilt. I want to take this compass that I did a while ago and make it into something more. Here is the concept drawing from Electric Quilt. The colours aren’t accurate to what I want to use and the background fabric of the compass is out of scale, but it is close enough to get the general idea of where I want it to go. The red will probably get switched out for something else since there isn’t any red in any of the fabrics I’ll be using. But there’s lots of time to decide before I get there. I have all the fabrics that I need for the backgrounds and borders now in my possession. So as soon as Friendship Chain is done I can start this. It is acting as a great motivator. I’m linking up to Kathy’s Slow Sunday Stitching and then I’ll be getting back to my stitching. First of all, I want to wish a happy Thanksgiving to everyone here from Canada who celebrates today. We have our full family coming for dinner today. I am so thankful for a family that loves one another and gets along so well! And I am so very thankful for all my friends both locally that I actually get to see in person and those I’ve never met in person but know through this wonderful medium of the internet. Our part of the work for our family dinner was mostly done yesterday, cooking the turkey and stuffing ahead of time and putting it into foil containers that can go into the oven to heat about an hour before dinner. I like having all that work and all the mess taken care of the day before. It gives so much more time to be able to be with the family rather than be in the kitchen.We’ll be going to church this afternoon and getting back in time to put finishing touches to gravy. We also decided we wanted a choice of dishes this year, so we’re doing a roast beef as well. And of course, no roast beef is complete without yorkshire pudding, so there will be that to do as well when we get home. In the meantime, I can show you what I’ve gotten accomplished on Friendship’s Chain. I’m down to only having one more row to do which is why there is a gap in between the two sections in the picture. 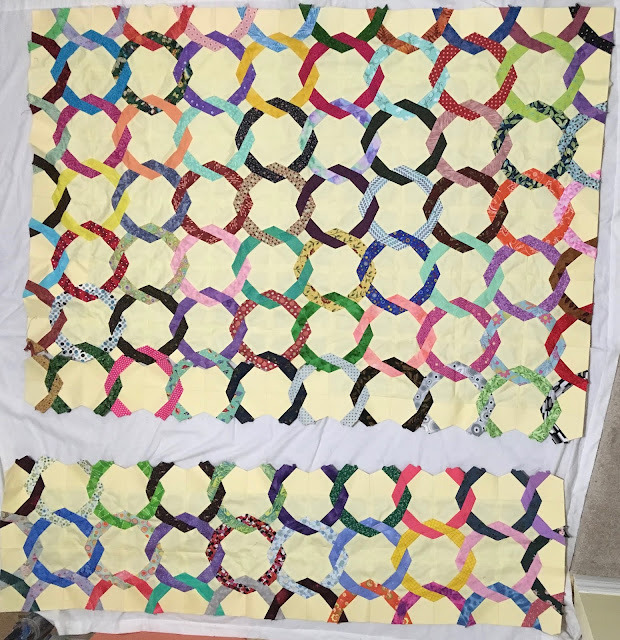 It’s in two sections because once I figured out a logical way to put it together, I had to start at the other end in order to be able to take pictures of the process for pattern writing purposes. As quilts grow in our little apartment we start to have problems with picture locations with adequate floor space and adequate light. This one just fits at the bottom of the stairs. I try to do most of my pictures outside but it’s wet and windy out there today. Plus I must confess to still being in my pj’s and not wanting to be outside that way. It’s been quite busy around here lately getting ready for our guild’s quilt show. I have finished the quilts for other people for it and now would like to get one more of my own done, but that’s not likely to happen. So instead, maybe I’ll slow down and work on getting this finished and quilted instead and then begin the pattern writing process for it. 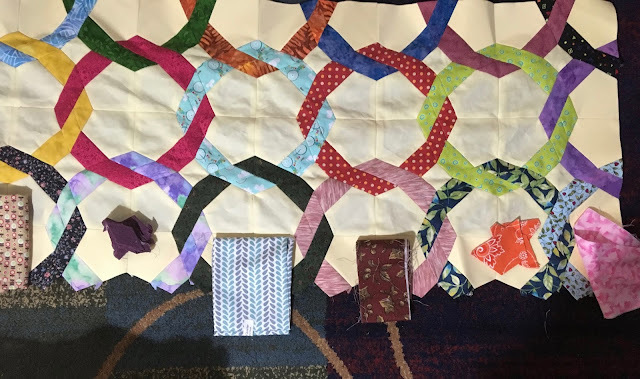 I also have a new quilt in mind that I’m itching to get started. It’s an expansion of the Mariner’s Compass I did back in August. 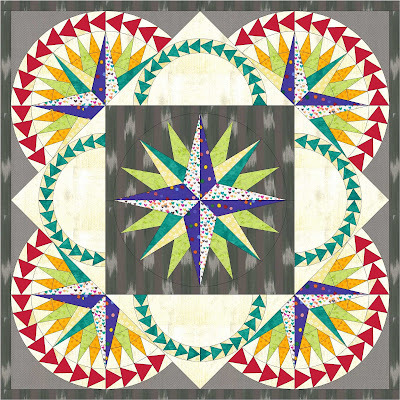 I want to get it set into a Medallion style quilt using other Compasses. But I will exercise what little self discipline I have and finish this first. I’m linking up to Kathy’s Slow Sunday Stitching and then I think I’ll get myself some lunch which is also breakfast. 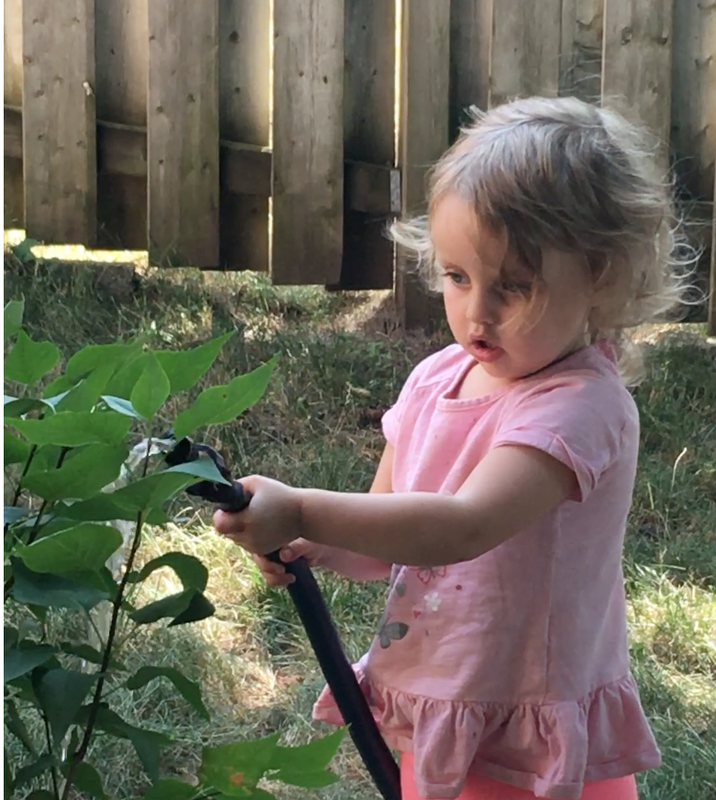 We were away for a week’s vacation so there was no post last week. We had a fabulous and restful week camping at the Pinery Provincial Park. In fact, it’s the best week we’ve had away in a long long time. It’s turned into somewhat of a running joke that the weather forecast is always.... the Shepherds are camping..... it’s raining and cold. But not this time. It quite reminded me about why it is that we go to all the work of packing up and setting up to go out into the quiet of the trees. I was beginning to wonder the last few times why we even bothered and whether it really was worth it. But this trip proved that yep..... it’s worth it. The day time temperatures were wonderful for being outside. The night time temperatures were perfect for sleeping under warm comfy quilts. I managed to find a spot quite near our campsite with a lovely shaded bench where I could sit with my stitching and look out over the river. While there I was treated to the sight of a blue Heron flying by and some Canada geese and some hawks hunting and gliding. As you can see by what is on the bench, I’m still working on Friendship’s Chain. Less than 2 rows left now to sew up and then it is finished. I don’t know if I’ll make my goal of the end of this month though. There are some busy days and evenings ahead. 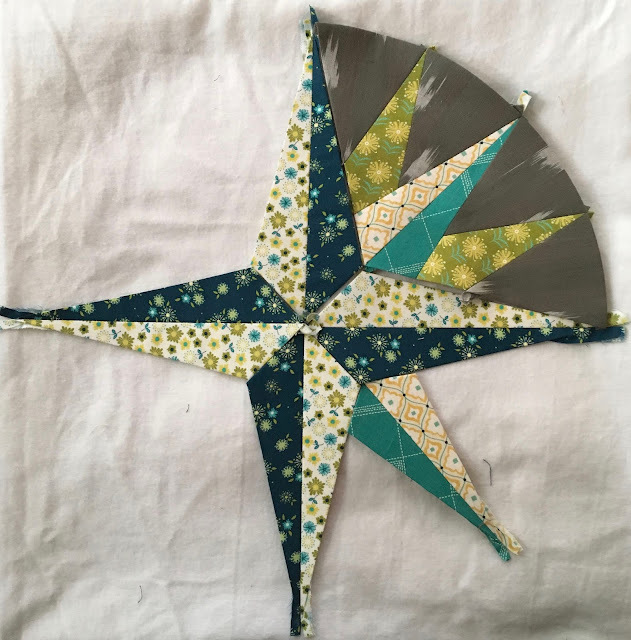 I’m doing an afternoon English Paper Piecing class this Wednesday and then a full day English Paper Piecing workshop on Saturday. 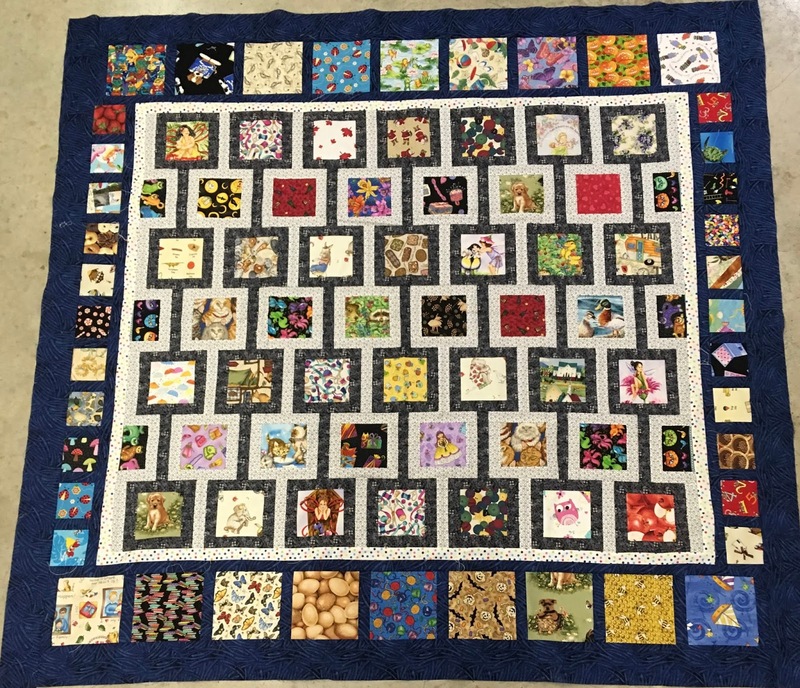 Then there are a few customer quilts to finish up in time for our guild’s quilt show a month from now. We are vending at that show, so there is stuff to get ready for that as well. All of that is seriously going to cut into my slow stitching time. But, I will continue to work on it as I can and get it done, slowly, one stitch at a time. I’m linking up to Kathy’s Slow Sunday Stitching before going back to do more stitching of my own. 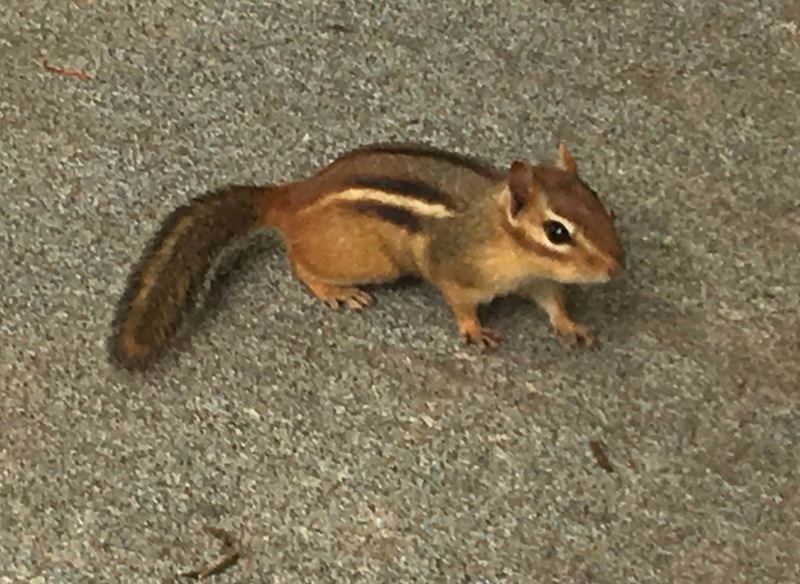 I’m in the process of chasing a squirrel. It’s a project that’s been in the back of my head for a while, and a couple of days ago it demanded to be let loose. At first it started as a mostly grey squirrel, but once it was partially assembled, I decided I didn’t like how dark it was turning out. Since there are potentially going to be a lot of these units, I don’t want the over all quilt to be that dark. 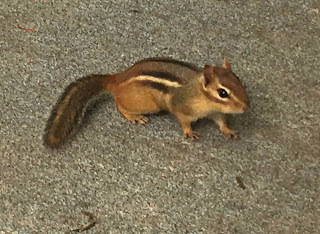 So then it turned into a brown/beige squirrel and I think I like it much better. Other than the very weird face in the hexagon. It’s supposed to be a rag doll, but it doesn’t quite come across like one. But they both have their down sides. If I use the greys, I’ll be limited in how many dark colours I can use, but there will be many more places to use lights and I could also use lots of brights. If I use the beige, I’ll be limited to mostly mediums and darks, but few lights. 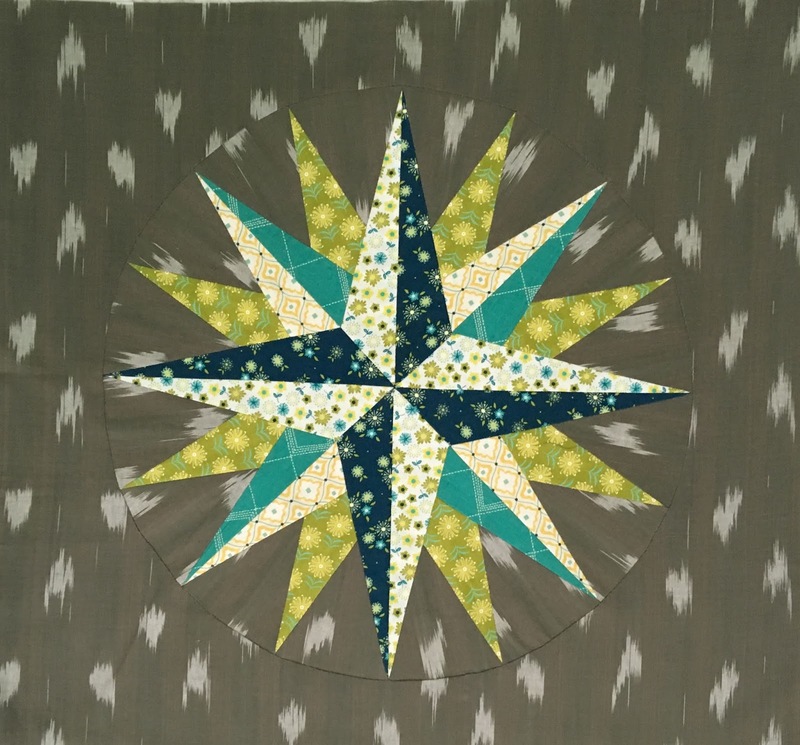 There’s a picture of where I am heading with this quilt here on the Quilter’s Cache. It’s a variation of the Jack’s Chain block. I’m going smaller with it and replacing the nine patches with a smaller square. But the layout will be the same. So I’m looking for opinions here..... what would you do.... grey squirrel or beige? It’s done, finished, finally. Sapphire Net is a finished quilt. The blocks measure 12 inches finished. 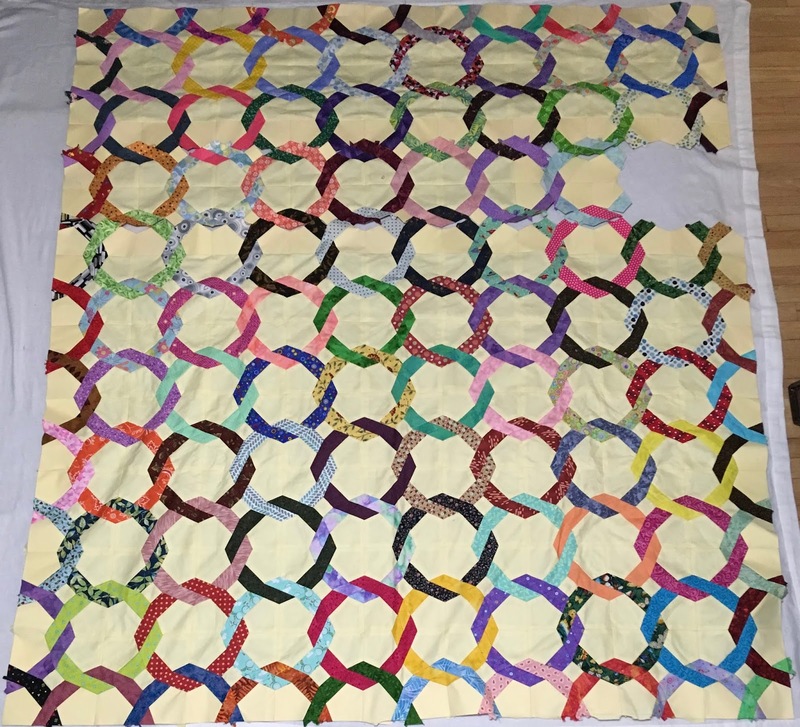 The entire thing, as shown, measures about 35 inches square. 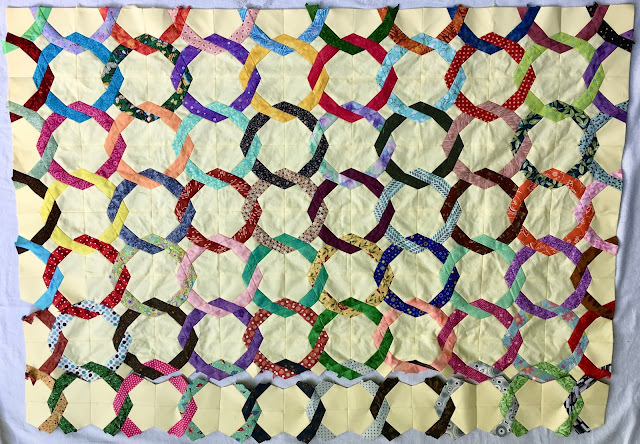 Not only is the quilt finished, but the pattern is done too. Double added extra bonus for me so I can call it done and done. And the third done is that it’s been added to the website. 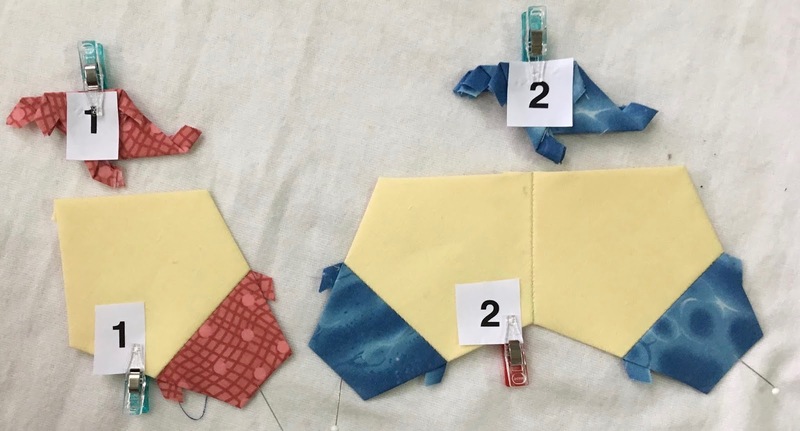 Printed pattern or pdf pattern and the papers for it too, since it’s English Paper Pieced. If you are interested, you can find them here Sapphire Net. 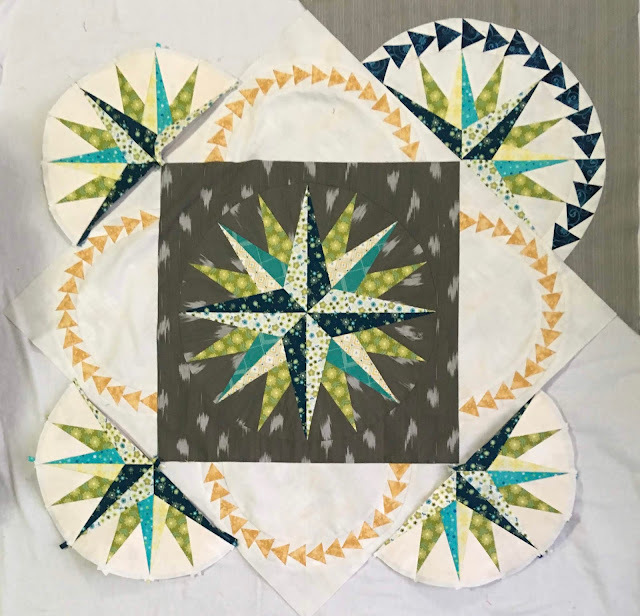 Amanda Jean, at Crazy Mom Quilts, took the summer off from her finish it Friday posts and I must say that I’ve missed them. It’s good to have her back. So, saying that, I’m going to link this finished to Finish it Friday. 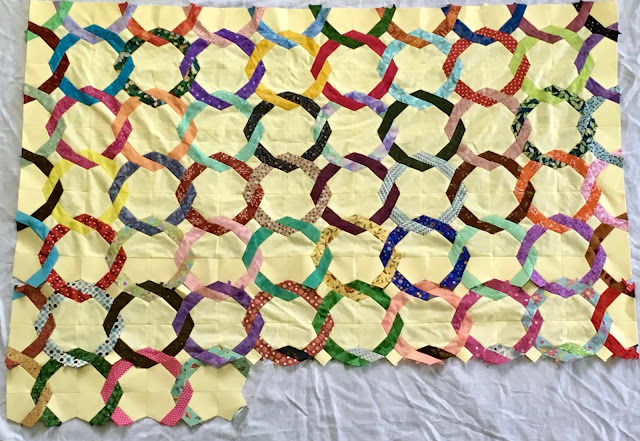 My new quilt called Friendship Chain is growing and taking shape. The mechanics of how to put it together are coming along. One of the things I wasn’t sure of was how to figure out which colours and fabrics would go where when adding on new rows. I think I’ve figured out an easy solution. Cut a whole pile of sets of diamonds and trapezoids out of lots of fabrics and colours. 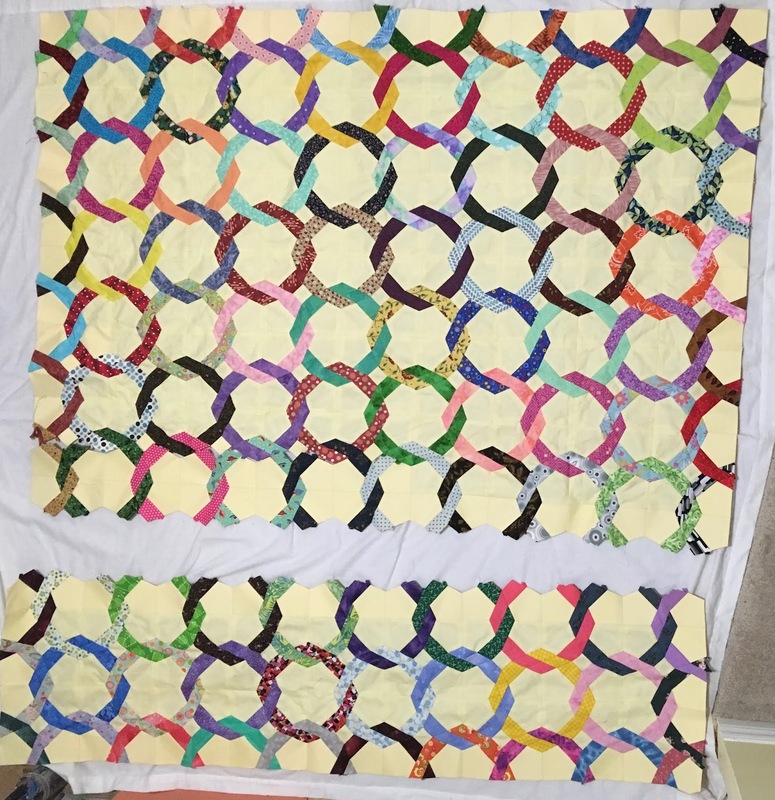 Then lay the new ones on top of the preceding row since they will be intersecting with that row, changing out colours and fabrics as necessary. Then make sure that there is enough contrast between the new additions that are beside each other so that the chains will be distinct from one another. Then I took pictures to remind myself of which colours were going where for reference. The last step is to clip a pair of diamonds to the bottom of the unit where they belong and then set the rest of them aside. Now I know which colour diamonds need to be sewn to which. 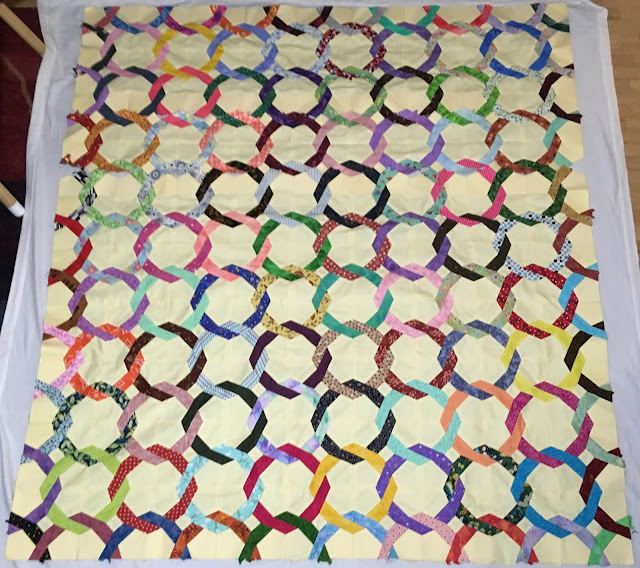 This picture is my working version with the some of the pairs already sewn in and the rest just clipped in place. I love playing with colour. My goal is to make this 8 full chains wide by 10 full chains long. 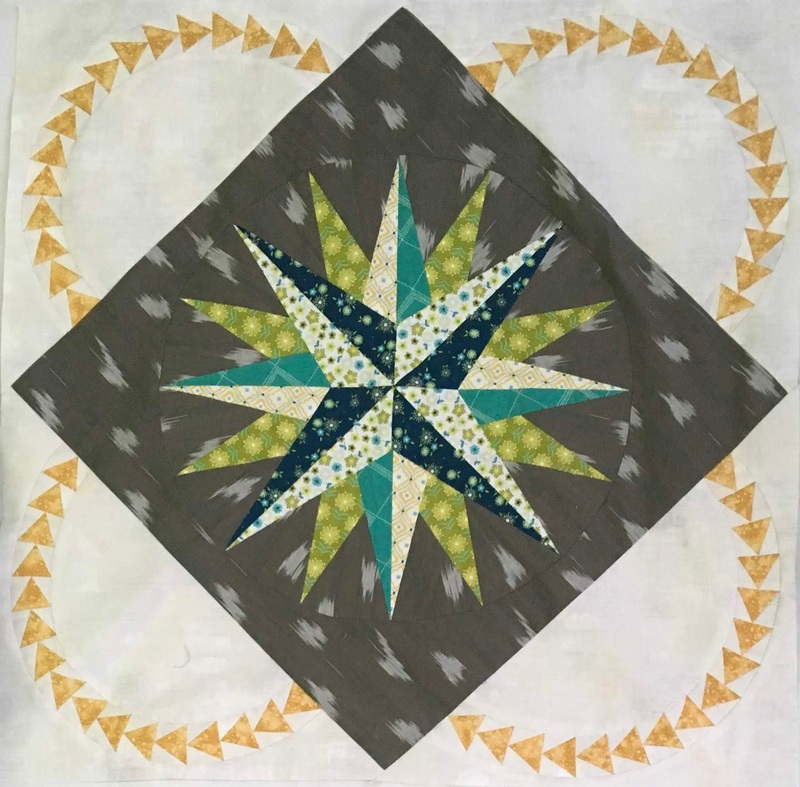 I would like to be able to make this a “charm” quilt, meaning that I won’t repeat a fabric. Whether I can make that goal is debatable at this point. The more important thing will be to achieve a balance of colour and brightness. I’m linking up to Kathy’s Slow Sunday Stitching. Then I’m going to take everything off the design boards and get to stitching. 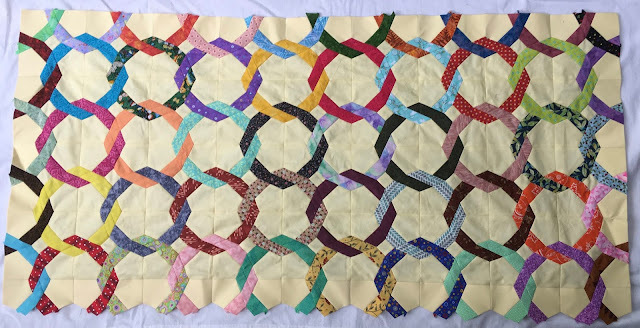 Last week I showed a picture of a quilt I’ve named Friendship Chain that I wanted to start. It was an Electric Quilt 7 generated picture - this one. Since then I’ve actually started on the quilt and made a bit of progress. It’s a bit of a challenge trying to figure out how to sew it together in a logical manner. If I were doing it in just two colours it wouldn’t be bad at all. But I want each chain to be a different colour and haven’t quite figured out yet the best way to do that. 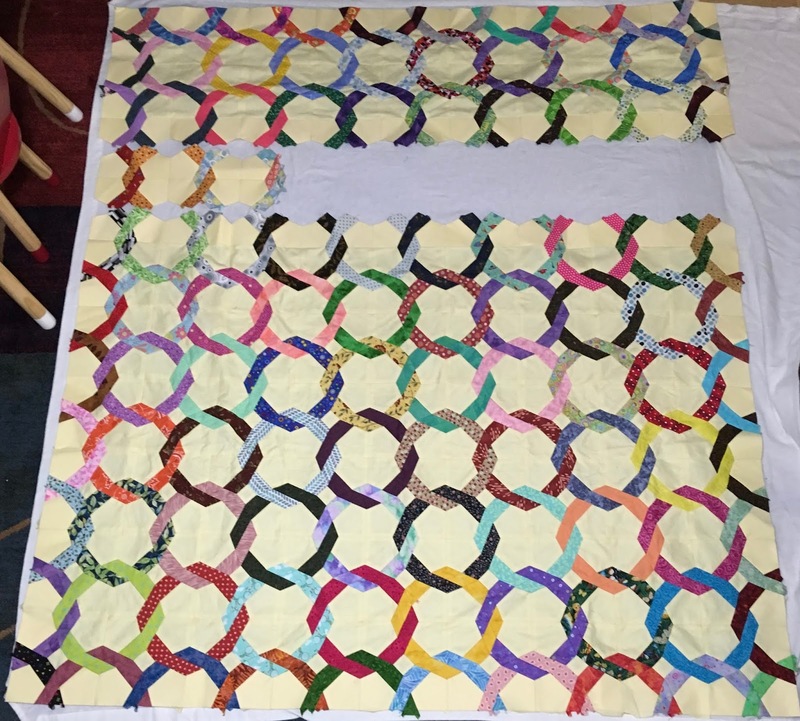 I’m English Paper Piecing it and am quite happy with the way it looks so far. 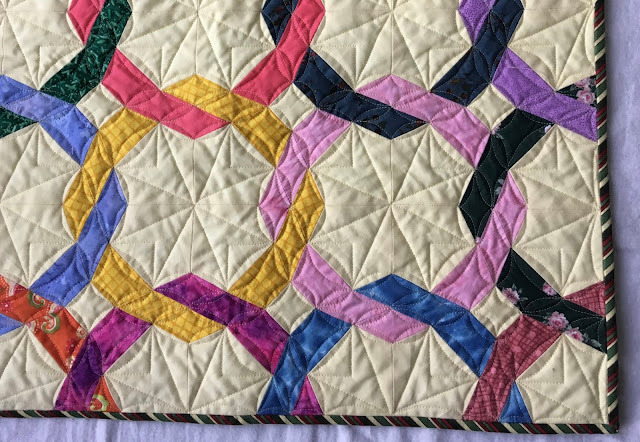 I’ve changed the triangles that show in between each block in the Electric Quilt picture to diamonds and that is part of what is making the piecing so challenging. But I didn’t want that extra seam in there. I suspect at some point I’m going to have to set up a design wall and lay it out and then do a diagram of what colours are going to go where and what will be paired with which. In the meantime, I’m having fun. I’m linking up to Kathy’s Slow Sunday Stitching.